Nathan Bruce Duthu, J.D. ’83, White River Junction, Vt., an enrolled member of the United Houma Nation of Louisiana, has been the Samson Occom Professor of Native American studies and the chair of the Native American Studies program at Dartmouth College since 2009. A board member of the Native American and Indigenous Studies Association, he has spent the past 25 years teaching and lecturing all over the world, including Russia, China, France, New Zealand, and Australia. He also is the author of American Indians and the Law. His latest book, Shadow Nations: Tribal Sovereignty and the Limits of Legal Pluralism, is due out early next year. Edgar “Dooky” Chase III ’71 (management), J.D. 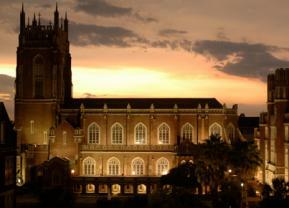 ’83, New Orleans, La., was named Jesuit High School’s 2012 Alumnus of the Year. Jerry Carlisle, M.B.A. ’83, New Orleans, La., was appointed to the Board of Directors of Pan-American Life Insurance Group (PALIG). Jerry is a financial consultant for the insurance and oil and gas industries, as well as the public sector. He is an adjunct professor in the College of Business at Tulane University, and previously served as deputy inspector general, audit & review with the Office of Inspector General for the City of New Orleans. Charles Pillow ’82 (saxophone), a top New York session player who has appeared on a variety of albums by artists ranging from Van Morrison and Ray Charles to Amy Winehouse and Joss Stone, has written a new big-band arrangement transforming Russian composer Modest Mussorgsky’s 1870s piece, Pictures at an Exhibition, into Miles Davis’ 1970s style jazz for the Roberts Wesleyan College Jazz Ensemble. Jeanne Bell '82, Jeanne Bell ‘82 (elementary education) was honored by New Orleans CityBusiness as a Health Care Hero for her work as the lifestyle coordinator at Lambeth House. Jeanmarie Nicholson ’78 (communication), J.D. ’81, Arlington, Va., received an OECA International Mission award for outstanding teamwork, perseverance, and commitment between EPA and the Coast Guard to jointly enforce U.S. and International air pollution requirements. The Hon. Michael Mentz, J.D. ’81, Metairie, La., took office Jan. 1 as judge for the 24th Judicial District Court in Gretna, La. Paul O. Dicharry ’69 (political science), J.D. ’81, Baton Rouge, La., of Taylor Porter, was named Baton Rouge Litigation – Environmental “Lawyer of the Year” by Best Lawyers. Vanessa Guidry Whipple, J.D. ’80, who in 1990 became the first woman elected to the Louisiana 1st Circuit Court of Appeal, was sworn in as the Baton Rouge appellate court’s first female chief judge. Vanessa served under four chief judges during her tenure on the appellate court, and she served eight years on the Louisiana Judiciary Commission, including serving as its chair. She sits on a Louisiana Supreme Court advisory committee that considers proposals to the American Bar Association’s Model Code of Judicial Conduct. Gina Trippi, J.D. ’80, Washington, D.C., started a wine business, Vegan Sommelier (www.vegansommelier.com). Steven J. Lane, J.D. ’80, New Orleans, La., managing partner at Herman, Herman & Katz, L.L.C., will be speaking on “professionalism” at the LSBA seminar, “Mastering the Deposition: Tips & Techniques,” on Nov. 28; presenting “How to Act Like a Professional” to Loyola University College of Law students on Dec. 6; and speaking at the Annual Family Law Conferences at the Pan American Life Center on Dec. 6. Steven J. Lane, J.D. ’80, New Orleans, La., managing partner at Herman, Herman & Katz, L.L.C., was named to the 2012 LAWDRAGON 500, a list of the top 500 attorneys in the U.S.
Givonna Joseph ’80 (music therapy/voice), founder and director of OperaCréole (www.operacreole.com, www.givonnajoseph.com), was interviewed for “Music Inside Out” on WWNO Radio 89.9 FM on October 4 and 6, 2012 (http://wwno.org/post/music-inside-out-givonna-joseph-and-operacr-ole). Michael J. “Mike” Hilferty ’80 (communication), Metairie, La., partner/director of property management for SRSA Commercial Real Estate, was named to New Orleans CityBusiness’ “Ones to Watch: Real Estate” list. Greg Buisson ’80 (communication), Metairie, La., owner of Buisson Creative Strategies, received the 2013 Silver Medal Award from The Ad Club of New Orleans for his outstanding contributions to advertising. Dorothy Thomas, J.D. '79, Dorothy Thomas, J.D. ’79, has joined Kean Miller’s Baton Rouge office as an associate. She will practice with the energy and environmental litigation teams. Prior to joining Kean Miller, she worked with the Louisiana First Circuit Court of Appeal. Michael K. Schroering ’79 (finance/management), Prospect, Ky., was appointed to the Board of Directors of General Employment Enterprises, Inc. Michael is the president of The Schroering Company (www.schroering.com), a Louisville-based commercial real estate firm specializing in consulting services, site procurement, and owner and tenant representation for the sale and leasing of office and industrial space. He is also managing member of Global Port United, L.L.C., and the managing director and owner of Leed HR, L.L.C. The Hon. James “Jim” Lamz ’76 (arts in commerce), J.D. ’79, Slidell, La., Slidell City Court, received the Crystal Gavel Award from the Louisiana State Bar Association for performing services out of a sense of duty, responsibility, and professionalism, and for having made a difference in his local community and organizations. Aristide C. “Jimmy” Eagan III ’79 (business), Kenner, La., vice chancellor for business and administrative affairs with Delgado Community College, is retiring from his position effective June 30, 2013. In almost 37 years at Delgado, Jimmy has managed the business affairs of the college in a succession of administrative positions, culminating with his current position, which he has held for almost 12 years.